Camphill Ghent joins the UN’s efforts to “voice our opposition to the abuse and suffering inflicted to some of our older generations”. Virtually all countries are expected to see substantial growth in the number of older persons between 2015 and 2030, and that growth will be faster in developing regions. Because the numbers of older persons are growing, the amount of elder abuse can be expected to grow with it. While the taboo topic of elder abuse has started to gain visibility across the world, it remains one of the least investigated types of violence in national surveys, and one of the least addressed in national action plans. The United Nations General Assembly, in its resolution 66/127, designated June 15 as World Elder Abuse Awareness Day. It represents the one day in the year when the whole world voices its opposition to the abuse and suffering inflicted to some of our older generations. 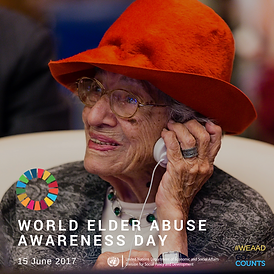 The 2017 theme underscores the importance of preventing financial exploitation in the context of elder abuse to the enjoyment of older persons’ human rights. In line with the 2030 Sustainable Development Agenda and the Madrid International Plan of Action on Ageing, older people have the right to a life of dignity in old age, free of all forms of abuse, including financial and material exploitation, which could lead to poverty, hunger, homelessness, compromised health and well-being, and even premature mortality.